Something I don’t read about nearly enough are female friendships. Honestly, I just don’t naturally gravitate towards books where that is a significant plot point. But I definitely want to read more, and Melanie Benjamin’s The Girls in the Picture was the perfect opportunity. It definitely has absolutely nothing to do with the fact that I fell in love with the cover. (From Goodreads) It is 1914, and twenty-five-year-old Frances Marion has left her (second) husband and her Northern California home for the lure of Los Angeles, where she is determined to live independently as an artist. But the word on everyone’s lips these days is “flickers”–the silent moving pictures enthralling theatergoers. Turn any corner in this burgeoning town and you’ll find made-up actors running around, as a movie camera captures it all. But their ambitions are challenged by both the men around them and the limitations imposed on their gender–and their astronomical success could come at a price. As Mary, the world’s highest paid and most beloved actress, struggles to live her life under the spotlight, she also wonders if it is possible to find love, even with the dashing actor Douglas Fairbanks. Frances, too, longs to share her life with someone. As in any good Hollywood story, dramas will play out, personalities will clash, and even the deepest friendships might be shattered. With cameos from such notables as Charlie Chaplin, Louis B. Mayer, Rudolph Valentino, and Lillian Gish, The Girls in the Picture is, at its heart, a story of friendship and forgiveness. Melanie Benjamin brilliantly captures the dawn of a glittering new era–its myths and icons, its possibilities and potential, and its seduction and heartbreak. The Girls in the Picture is probably not the kind of book I would normally pick up if I saw it in a bookstore. But, if I’ve learned anything over the past year, it’s that I should take more chances on books, and read more outside my comfort zone. Because you never know when you might find a hidden gem. And I think The Girls in the Picture is definitely one of them. This book reminded me a bit of The Seven Husbands of Evelyn Hugo, which I read and loved last year. They’re actually fairly different books, but I got the same feeling reading each of them. It was somehow both heartwarming and heartbreaking at the same time. The Girls in the Picture was especially interesting because it was about real people. And, if you’re anything like me, you’ll need to Google every single one of them (a lot). It was so interesting to learn about these figures that were such huge parts of making Hollywood what it is now. I wasn’t alive during any time this novel takes place, but it made me feel nostalgic just because my grandmother used to talk about these actors and their movies often. It made me want to watch some of these old Hollywood movies. I honestly kind of hate visiting Hollywood because of all the tourists (I know that’s such a Southern California thing to say), but there really is something a little bit magical in the air when you stroll through Hollywood Forever cemetery or look up at Grauman’s Chinese Theatre, and this book is as close to that feeling as you can get without actually being there. I loved that the friendship between Frances and Mary was the center of this story, even though there’s so much else going on. And I thought that alternating perspectives was a great way to tell it. I will say that the different points of view – Mary’s was told in third person, and Frances’s in first – was occasionally disorienting, but not enough to pull me out of the story. And this story was definitely immersive; I got pulled in immediately, and really felt transported into a different world. This wasn’t a fast-paced book by any means, but it’s a story that deserves to take it’s time and be savored. 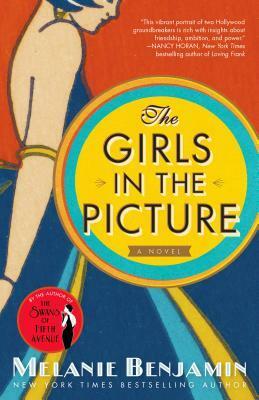 ★★★★☆ – The Girls in the Picture is a great novel about an epic female friendship. It was a pleasure to read, and I am definitely looking forward to reading more of Melanie Benjamin’s work. Good news! The Girls in the Picture is available in paperback now! You can order your copy on Amazon. And, I’m not trying to influence you or anything, but the new paperback edition (pictured above) is gorgeous. Just saying. To get the audiobook for free, use this link to sign up for a free trial of Audible and choose The Girls in the Picture as one of your two free books. This book was generously provided to me by Wunderkind PR. All opinions are my own.